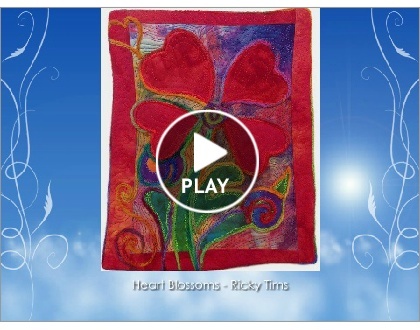 Hoping to spread a little love, Ricky created a fun project in February for Valentine's Day which he named Heart Blossoms. He asked members to spead their love by sharing their finished projects. We thought we'd spread the love by showing them to you here. The pattern is available on the Projects page. Download the pattern here. Once you are at the Heart Blossoms page, click on the VIEW THIS PROJECT button to see the PDF. You'll need Adobe Flash to play the Smilebox. Ricky, I loved your piano music as much or more than the art. Thank you so much. Thanks for the slide show of many possibilities. I will be making many for my grandkids. I loved Ricky's Heart Blossoms and made my version as soon as the pattern was available (8 - Hearts for Terry in the slideshow). So far so good. However since then he expects a small quilt every Valentine's. So far I've made at least 8. They go above our bed every February. Now they are starting to spread outside of the bedroom. I love that one small thing can go on to be part of your life - a tradition. Thanks for posting the Heart Blossoms again! I did not participate last time around, think I’ll make something just for fun now. Wow! They are all wonderful. Very creative.